Today we meet Lisa Wilson. 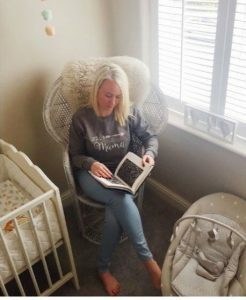 Based in the UK, Lisa is the founder and owner of Still A Mama. She founded Still A Mama after her daughter Gracie was stillborn in July 2016. 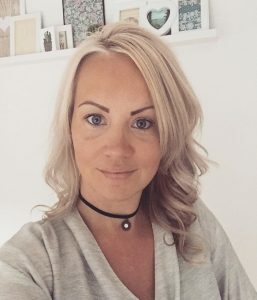 Using her passion and creative skills, Lisa designs products to honour all babies taken too soon and sells them through the Still A Mama website. In this way, she supports Angel Mums on their journey to building a new normal. Lisa kindly shares her very moving story in her own words, in this interview. She is an incredibly resilient mother, and I know you will be impressed by this inspiring woman too. All I've ever wanted in life is to be a Mum. Having experienced infertility, miscarriage and stillbirth, maybe I need to be more specific in asking the universe to allow me to be a mother to a baby that is alive. You see I am a Mum, just not in the way I had ever imagined. Imagine someone saying to you, 'In a couple of hours, everything you know and think about life will be gone. Your whole belief system and soul will be ripped out of you – physically and mentally, yet you will remain.' You’d say they were crazy, but this is exactly that what occurs with baby loss. Baby loss is multi-faceted, complex and messy. The pain is indescribable. The moment I heard those words ‘there is no heartbeat’, it felt like I was having an out-of-body experience. Your worst nightmares seem mild, to live this nightmare is horrific. How can you recover when you are constantly having flashbacks and reliving this nightmare over and over? Separate to the physical pain of your baby being taken, your core being is stripped from you. Your belief system, thoughts, feelings, relationship with yourself (never really knew I had one before this), friendships, lifestyle, work ethic, morals, support systems and strategies, in fact your whole entity – gone. And to top this off, society treats you like a leper. Welcome to the world of baby loss – it's not a club we ever wish to join. Weirdly, this club is also a pretty amazing place to be. When you meet another loss Mum and you don’t even need to speak – you connect with an unspoken mutual understanding. You build resilience over time and survive because others before you have done so, and sadly many others will also follow. In baby loss, we accept, we adjust but we never get over it. All parenting approaches and life philosophy fly out the window when a baby dies. (Yes babies die – but people don’t want to talk about it ). Your whole being is deconstructed in ways you never knew were possible. It is incredible that anyone can survive the aftermath of baby loss; living on without your child is doing the unthinkable, and continuing to function, is doing the impossible. Just because your baby isn’t here doesn’t mean that you are not a Mum - you are Still a Mama and you will continue to parent your child every day, just not in the way you had hoped. Losing my baby has certainly changed my parenting approach. I am and always will be Still a Mama to Gracie Rose stillborn on 7 July 2016 and always still loved. Losing Gracie meant everything I thought I knew changed. Even in the extreme pain of loss, deconstructing everything you thought you knew is quite liberating. There is strength in being vulnerable. It takes bravery to be open to the hurt. It has been a year of hurting so bad ... but it has also been a new definition of self, an alteration of being, a new way of seeing and a new love - that is so strong, that it made saying hello and goodbye in the same day worth all the pain. Just Breathe - this is all you can and will do for a very long time. This is ENOUGH. Do not let your suffering become a measuring stick of your love - how I punished myself in them early days - relief from your grief is allowed. Punishing yourself isn't helpful. Your mental health is a priority, self-care is a priority and your existence is a priority. You can still be a kind person with a good heart and say no. Do not expect yourself to be the person you was before. This is the new you. You will be getting to know yourself for the next few years. Giving yourself timescales particularly in the early months; on when you think you'll feel better are not helpful ... (I did this and set myself up for the biggest fall of my life). You will lose 80-90% of your support network. This is normal in baby loss. People will do things that hurt - it is okay to take a year out and re-assess relationships and friendships. It is okay to distance yourself from people who are pregnant and to unfollow people on social media. You are not a bad person for doing this. It is essential that you speak with another loss mum, it confirms that your thoughts that feel crazy are normal in baby loss. You will share many similar experiences in how society deal with this tragedy. Motherhood seems like some cruel joke taunted in your face and there are reminders everywhere; protect yourself as much as you need to. Reminders still hurt, you just don't feel the pain as often. However, be aware that grief stings and stings when you least expect it. Do not fight it. It will always win. Your relationship with your partner will be tested beyond belief. Live each day to honour your baby. They are never more than a thought away. You will learn a new love that is so strong, that it will make saying hello and goodbye in the same day worth all the pain. You cannot pour from an empty cup. Self care isn’t selfish, it is necessary. When you are overwhelmed, tired or stressed, the solution is almost always …less. Get rid of something, or lots of somethings! Simplify your life and try to live slow, you will be getting to know the new you over the next few years, so be kind always! Would you treat a 4-year-old as you do yourself? No, so be gentle on yourself; you are doing the best you can and if you could be doing any better you would . Try to seek calm in the chaos by re-discovering joy in the ordinary and by simple things such as listening to the birds when walking, cooking a meal, listening to favourite songs and reading. Cut down the noise by reconnecting with yourself creatively and spiritually - try to enjoy the things you love. Live minute by minute if needed, hour by hour if so, and day by day when you can. You can and will survive this! A life of joy… is a place where beauty and sadness meet – if you’ve been there yourself, you know this already – where the two become indistinguishable. It’s the place where sadness is no longer ugly, and grief begins feeling like soap in a wound; painful yet purgative at the same time. My wish for my children is… to touch the lives of others and to be honoured and remembered every day. Honour every moment of your pregnancy and make as many memories as you can. Lisa Wilson is the founder and owner of Still A Mama, which she founded after her daughter Gracie was stillborn in July 2016. Still A Mama has been created to break the silence of stillbirth, honour all babies taken too soon and to help loss mothers on their journey of building a new normal. It also provides an environment to open up about the tragedy that is parenthood after baby loss and enables loss parents the opportunity to be proud of their babies and the love they have brought to their lives. Still A Mama is creating a blanket of love and awareness across the world; this has been achieved via the power of social media, leaflets in bereavement suites and by shipping items globally – no woman should ever walk this terrible path alone. You can connect with Lisa and Still A Mama on her website, Instagram, Facebook and Twitter. Or. get in touch with Rowena. She supports parents move from experiencing the pain of loss, unwanted change, anxiety, challenge and imbalance, to living a life of balance and happiness. A life full of joy, hope and love. And don't forget to subscribe to ensure you never miss a post.